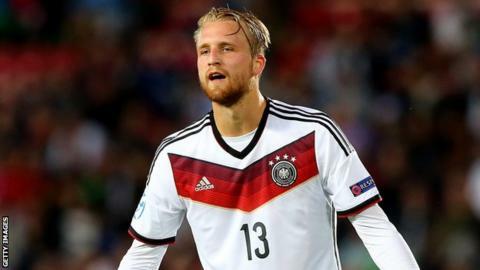 Brentford have signed Germany Under-21 international Philipp Hofmann from FC Kaiserslautern for an undisclosed fee. The 22-year-old striker, who scored eight goals in 33 appearances for the German second division side last season, has agreed a three-year deal. "Philipp is a target man, physically strong, and a good header of the ball," head coach Marinus Dijkhuizen said. "He is a different type of striker to Andre Gray, so it gives us more tactical options." Hofmann came through the youth system at Schalke and had loan spells at SC Paderborn and FC Ingolstadt before joining Kaiserslautern last summer. He has represented Germany from Under-18 level upwards and featured at this summer's Under-21 European Championship in Serbia. Hofmann is the west London club's seventh signing of the summer.